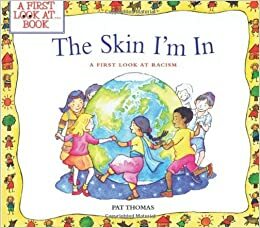 Summary: The Skin I'm In by Pat Thomas introduces children to the concepts of racism, skin color, culture, and differences. It starts off by having the reader imagine living in a world where only people with certain characteristics could do things, and explains how this way of thinking is unfair. Then it goes on to explain that our looks come our family background, which is known as our culture or race. Then the book goes on to discuss racism and how bullying others about their race is unfair and can make others feel sad. The end of the book touches on an important point which is that even though we all may be a different race and have different backgrounds, we are more alike than we think we are. The main lesson from this book is that if we accept everyone for who they are and their differences, we are able to create a safe and comfortable community for everybody. Element 1: In Element 1: Self-Love and Knowledge, students learn about themselves and their culture, race, and religion. They learn about differences between people and see that negative stereotypes are unfair. I feel that this book does at great job a representing this element. The author explains how our differences come from our culture and that our culture tells us about where our family came from. Students will see that we all are different because we come from different cultures, and that people from different cultures can have a lot in common. The illustrations also show many people of different races interacting, which sets a good example for students. They also show images of unfair treatment, like a little boy getting more ice cream then his friend who is of another race. On the next page it shows an adult talking to the man who gave them the ice cream, which deconstructs the negative behavior that was shown. How to use: There are two points in the book where the author asks questions to the reader in a what about you box, for example: What are the variety of skin colors that people come in? In my class I would do a read aloud with this book, and stop at these sections to ask my students the questions. I would record their answers either on the board or on a easel, and review them once we are done reading. That night I would give the students a sheet with questions to as their families about their culture and history. The next day we would come in and each student would come in and talk about their family. I would then put them in groups where they would discuss the differences that they have, but also what they have in common. We would record what they discuss and hang it in the classroom, so they are always reminded that we are different, but alike.